Everyone knows at least a few people who are fans of electronic or experimental music. But if you ask one of them where the best music comes from, you’re unlikely to hear them say “Tucson.” Sure, Tucson is the home of Linda Ronstadt, Giant Sand, Green on Red, Calexico, and many others. Twanging guitars, maracas, and accordions abound. We all know that. But like the desert itself, Tucson’s musical landscape often requires that you look under some rocks to find the gems beneath the surface. Simple Question is one of those gems. Simple Question formed when Amoeba guitarist, Rick Davies met alto sax player, Chad Bush on a busy night on 4th Avenue in 2003. Chad had been fronting Tucson’s Clown Band (as his clown alter-ego, Windpipe) with varying degrees of satisfaction and Rick was working on a solo project until the next Amoeba recording project took shape. 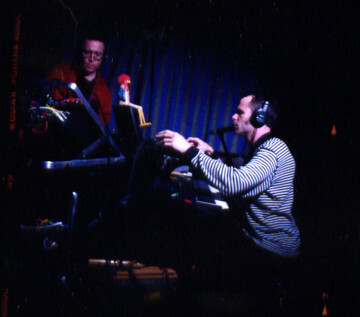 Both Rick and Chad were tired of playing in traditional group arrangements and were eager to use literally everything at their disposal to make music. Not knowing exactly what to expect, they armed themselves with guitars, woodwinds, percussion, synths, samplers, and loopers, and quickly discovered they were always ready to try something new, to run with it when it worked, and to quickly change course when it didn’t. They found themselves as comfortable doing their thing in the recording studio as they were in front of an audience. Their first studio recording, 8th, is a double CD, produced by Rick at his studio, The Lumber and Cheese Shop and mastered by ambient pioneer, Robert Rich. Although 8th showcases Simple Question’s gentler side, it takes you through some deep, dark terrain, too and makes an excellent audio travelling companion that you’ll enjoy on your way from one moment to the next.